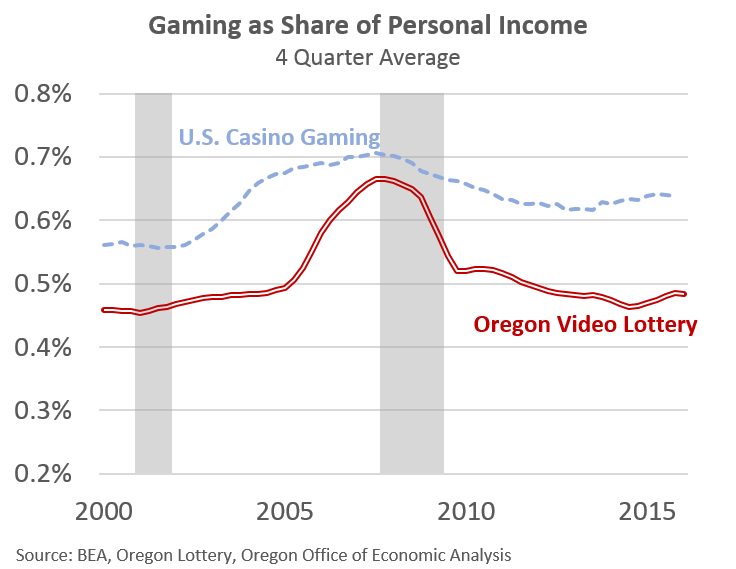 Today completes our recent check-ins on vice revenues with a quick look at gaming here in Oregon and across the country. Previously we looked at cigarettes and tobacco, and recreational marijuana. Over the past year, gaming revenues have clearly rebounded following an extended period of very slow to no growth in the aftermath of the Great Recession. The increases here in Oregon did coincide with the Lottery’s capital replacement program which is replacing the 12,000 or so video lottery terminals throughout the state. As of today, each retailer has 2-3 new machines. And while the new terminals are clearly impacting sales, the gaming trends in mature markets have picked up nationally as well. 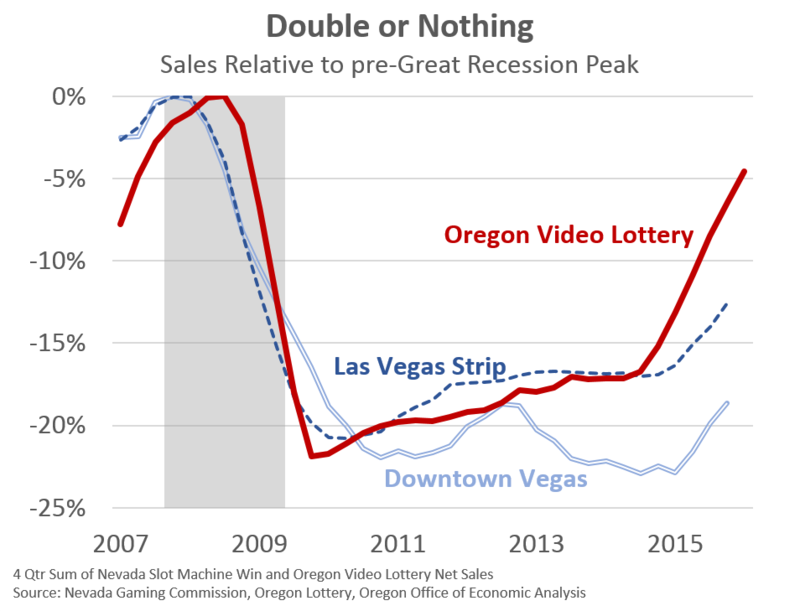 The first graph below compares video lottery sales here in Oregon with slot machine revenues in Las Vegas. Each location saw a 20-25 percent decline relative to pre-Great Recession highs, followed by 4-5 years of hardly any growth. Bill McBride at CalculatedRisk likes to update visitor and convention figures for Las Vegas as a measure of economic recovery, particularly as Las Vegas was ground zero for the housing bubble and collapse. While tourism has boomed in Las Vegas over the past 5 years — hotel occupancy, retail sales tax collections, etc are at all-time highs — it was not until the past year or so that gaming revenues saw their first real uptick. Growth over the past year is in the 5-10 percent range with data through 2015q4. Beyond Las Vegas, our office tracks 20 or so states’ casino revenue and/or video lottery sales. These are the states with readily available online data that allow for easy analysis and comparisons. Clearly many markets have seen increasing sales in the second half of the year, a reversal of recent trends. Some of the growth rates overstate underlying performance of the gaming industry. MD and OH casinos are still relatively new, so their growth is at least partially due to the brand new casinos, which do pull sales/revenue away from existing markets, often times in neighboring states. This is readily apparent in the increasingly competitive market in New England. 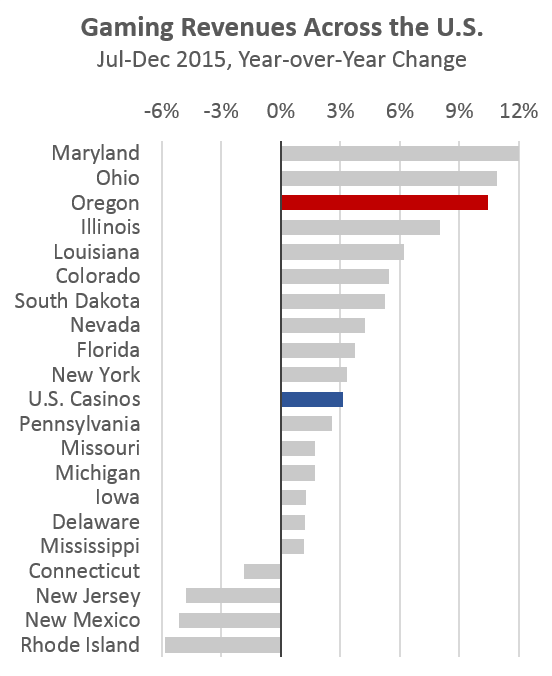 Sales are falling in the more mature markets of CT, NJ and RI, yet growing in NY, PA and MA (not shown here). However, given the gaming rebound is seen throughout the country, it does point toward a larger macroeconomic driver of sales than just idiosyncratic local events. Two possibilities stand out. The first is that the economic improvements in recent years have now translated into households feeling more confident in their finances, and have increased discretionary spending. Work from Sentier Research shows that inflation-adjusted median household income is now all the way back to pre-Great Recession levels. Second, lower gas prices allow households to spend more money on other categories, gaming included. Even with the rebound over the past year or so, it’s important to point out that spending on gaming remains a smaller share of personal income than in the recent past. This is particularly so here in Oregon. Sales are outpacing income gains over the past year, however that has not been the case since the Great Recession. In terms of the outlook, our office continues to raise sales expectations given the strong growth, ongoing economic strength and low gas prices. We still expect some pullback in terms of growth rates, as the new video lottery terminals are likely to have some novelty impact that will wear off. Furthermore, double-digit growth, or nearly double-digit growth, does not last forever. In the near term this outlook does leave room for both upside and downside risks, depending upon how long the strong growth persists. Over the extended horizon, our office expects video lottery sales to increase more in-line with overall personal income gains, albeit a little slower. The industry remains fiercely competitive with new entrants trying to gain market share (internet gaming, more private or tribal casinos, etc) and facing potential demographic issues in terms of recreational preferences for younger generations. « Where are the Construction Workers? I did not see any reference to gaming on Indian reservations which has to be seeing similar trends? We do not have data on tribal gaming in Oregon and the tribes are not required to share the information. There is some tribal data in the state numbers reported here, for example, New Mexico is just tribal casinos. In terms of Oregon, I would not be surprised to see a rebound given the trends seen in video lottery. Last publicly available data from a few years ago indicated tribal revenues in Oregon fell 10-15 during the recession, but I have not seen any updates since.